In the way of many of P.G. Wodehouse’s novels, Mike and Psmith has a complicated history. In 1909, Wodehouse published a lengthy (some people *ahem* might call it overly long) novel entitled Mike. The first half detailed Mike Jackson’s entirely dull experiences as a school boy; the second half introduced the extraordinary Psmith, who made Mike’s remaining school days decidedly less dull. Wodehouse reissued the second half (with a few changes) as Enter Psmith in the 1930s. In 1953, the two parts of Mike were rewritten and reissued as Mike at Wrykyn and Mike and Psmith. For those of us who, though fond of Comrade Jackson, have no interest in his solo adventures, Mike and Psmith is an ideal distillation of the story begun back in 1909. …Psmith followed his leader with the pleased and indulgent air of a father whose infant son is showing him round the garden. Psmith’s archaeological research struck a new note in the history of that neglected science. He was amiable, but patronizing. He patronized fossils, and he patronized ruins. If he had been confronted with the Great Pyramid, he would have patronized that. I have just realised that my fondness for Tony Morland owes no smart part to his similarities with Psmith; namely, their amazing sangfroid, their passionate interest in other people and things, and their extraordinary gift for condescending to others. Fascinating. The headmaster seemed to have some difficulty in proceeding. He paused again. Then he went on. “There isn’t a lunatic on the list, sir,” said Psmith cheerfully. For me, these exchanges are so far preferable to Wodehouse’s descriptions of incomprehensible sporting achievements. This is what Psmith does best (as can be seen in those other fine novels Psmith in the City, Psmith, Journalist, and Leave it to Psmith) and it is why he will always be my choice for fictional character I would most like to have with me in a troubling situation. Or, frankly, any situation. You can keep Uncle Fred and Gally, Jeeves and Lord Emsworth. To me, Psmith will always be Wodehouse’s greatest and most charming creation. Oh what a lovely tribute. I have yet to meet Psmith – I’ve only read about Jeeves so far – but this wonderful review makes me want to pick up the book immediately. I don’t know how I feel about reading about cricket for whole chapters but I do often read about sports in the school stories books I like. The Trebizon novels have the main character take an interest in tennis and I did learn quite a bit. Interesting parallel drawn with Tony Morland- I’ve only read High Rising and Wild Strawberries but, as I understand, Thirkell dedicated whole books to the character. He’s certainly unforgettable and one of the highlights of High Rising! It sounds just lovely – I am equally ignorant of cricket, but I think the character of Psmith alone would make these worth reading! I must confess to gaining most of my own personal knowledge of cricket (very meagre!) via Lord Peter Wimsey’s exploits on the pitch (is that correct?) in Murder Must Advertise. P.G. Wodehouse has been most helpful on educating me regarding the finer points of golf, though, another gentlemanly (gentlepersonly?) occupation which is (so far) foreign to me in actual practice. I read a lot of Wodehouse when I was at College but even then Psmith was not one of the characters with whom I spent any time. I’ve been thinking for a while that I should of back to the great Plum. While I enjoyed his humour as a teenager I think I would appreciate his style now. Perhaps I might try Psmtih rather than going over those novels I’ve already read. Just what I was thinking, Leaves & Pages. Wimsey of Balliol blowing his cover as Death Bredon by performing brilliantly at the company match. Oh, your post made me so happy! I read all the Psmith books last year and was completely in love with him as a character (although as one of those characters that I very much doubt I would like in real life!). 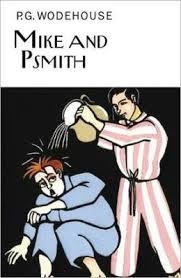 ‘Psmith, Journalist’ is one of my all-time favorite Wodehouse books (as is ‘Leave It To Psmith’). That book had me in tears from laughing so hard. I think I’ll be reading this again myself before too long! I had no idea of the complicated history of Mike & Psmith! Though PGW’s non-Jeeves books can be hard to find. I once left a copy of Mike at Wrykyn on the shelf at a bookstore. As much as I enjoyed this one, I didn’t feel that Mike without Psmith would have the same appeal – and you’ve confirmed that for me. I do love Psmith, but I don’t feel quite the same connection to Tony Morland. YES. BETTER THAN JEEVES. (I already knew that you and I agree on this point, but I am still happy to have it reinforced once more.) I have to reread the Psmith books one of these days — it’s been a while! _Leave is to Psmith_ is my favorite Wodehouse. Jeeves is wonderful, but Psmith is brilliant. Lovely review, and great start to ACOB2014! I’ve only read Psmith Journalist from the Psmith list, and love him of course – and I love that last excerpt you quote especially. But the cricket might put me off for the moment… like you, AAM has taught me all I know, and it’s more than I would wish. “Leave it to Psmith” is also my favourite Wodehouse book. “Mike and Psmith” is more of a curiosity. I am a big cricket fan (being an Australian) and I did not mind the cricket bits, but even for me they tended to be a bit long. I am going to read all about Psmith, thanks to you!